Home » Lossless Blu-ray Backup: why choose MKV format? While there are various video formats like AVI, MP4, WMV, 3GP, why do we choose MKV (Matroska) format for backing up Blu-ray and DVD? Well, MKV format has a number of advantages comparing with other formats. To short in one sentence, because MKV format allows for lossless Blu-ray/DVD video quality with all subtitles and audio streams included, and not yet any other format can achieve this. Find below detailed reasons why MKV is much favored by movie enthusiastic and how to copy Blu-ray and DVD to MKV format. Why Choose MKV Format to Rip Blu-ray and DVD? Advantage 1. Chapter info, multiple audio and subtitle streams can be preserved. The MKV format is capable of holding unlimited number of video, audio and subtitle tracks, along with any metadata. Practically this means that it is possible to put entire movie with multiple sound and subtitle tracks, chapter information and movie thumbnail into single file. 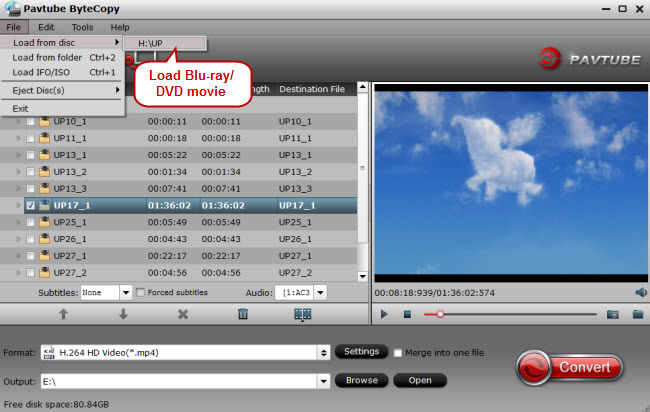 When copying Blu-ray movie to MKV, you can have all subtitles and audio tracks sealed into the MKV file. Advantage 2. Lossless quality can be retained when ripping Blu-ray Disc/DVD to MKV. MKV is a container format that supports various codecs, including H.264, VC-1, AC3, DTS, etc. Basically Blu-ray movie clips are saved as H.264/MPEG-4 encoded .m2ts files with AC3 or DTS audio (a small percent of BD movies use VC-1 codec and PCM 5.1 audio). The compatibility of MKV format makes it possible to keep original H.264 codec when converting M2TS clips to MKV files. By directly package video contents into MKV container without en-decoding, lossless video quality is retained and the process is shorted to 1-2hrs. Advantage 3. MKV format is widely supported by media players. Advantage 4. Can anything be more flexible? Want to remove unneeded audio track from the file? Thought about converting MPEG-2 video into H264 to make the file 5 times smaller? All of it can be easily done with free software. And it supports soft subtitles and external subtitles! Why Choose Pavtube ByteCopy to Rip Blu-ray/DVD to MKV? 3. keep original BD/DVD chapter markers, and other meta data. 3. transcode VC-1 encoded Blu-ray movie into H.264 encoded MKV file. The Matroska format is a multimedia container envelope for video, audio and subtitle files. An entire CD or DVD can fit inside a single file. The extension for a Matroska file containing video is MKV; for audio only MKA, and for subtitles only, MKS. The MKV format has many advantages over competing containers like Microsoft®’s Audio Video Interleave (AVI), Apple®’s Quicktime® MOV, Moving Pictures Experts Group (MPEG) and others. While each of the container formats in use today fulfills some or even many of the features desired in a container format, Matroska aims to be the standard that meets them all, setting it apart from virtually all others. Built on EBML (Extensible Binary Meta Language), it is highly flexible for meeting future needs.